Minimally invasive spine surgery (MISS) has been the surgical solution for millions of patients with neck or back pain. It is one of the most popular types of orthopedic surgery because it produces great results in a short period of time. These advantages are seen because surgeons make tiny incisions and access the spine without having to retract or dissect large muscles. Tiny surgical instruments and live imaging are used during Minimally Invasive Spine Surgery so little muscle trauma occurs during surgery. A discectomy. Small portions of diseased or damaged intervertebral disc or bone spur is removed so it no longer compresses the spinal cord and/or nerve roots. This can eliminate both the localized and/or radiating pain associated with a herniated disc. A spinal fusion. Part of a diseased or damaged disc is removed and then replaced with bone graft. Adjacent vertebrae are fixated in place using rods and screws. Bone remodeling takes place after surgery and a single, solid bone is formed. Following a minimally invasive discectomy or spinal fusion, patients typically experience a significant amount of pain relief. Degenerative disc disease. The wear and tear of vertebral bone and soft tissues due to aging. A herniated disc. The protrusion of an intervertebral disc into the spinal canal and subsequent compression of the spinal cord or spinal nerve roots. Spinal stenosis. The narrowing of the spinal canal and compression of the spinal cord. The pain that originates in the lower back and then radiates down through the buttocks and legs. Other conditions treated by Minimally Invasive Spine Surgery include spondylolisthesis, spinal fractures, and spinal deformities. If you are experiencing neck or back pain that does not respond to nonsurgical treatment options, please contact our offices in Glen Rock or Maywood, NJ to make an appointment. One of our Orthopedic Spine Specialists will find out what is causing your pain and then come up with a personalized treatment plan. 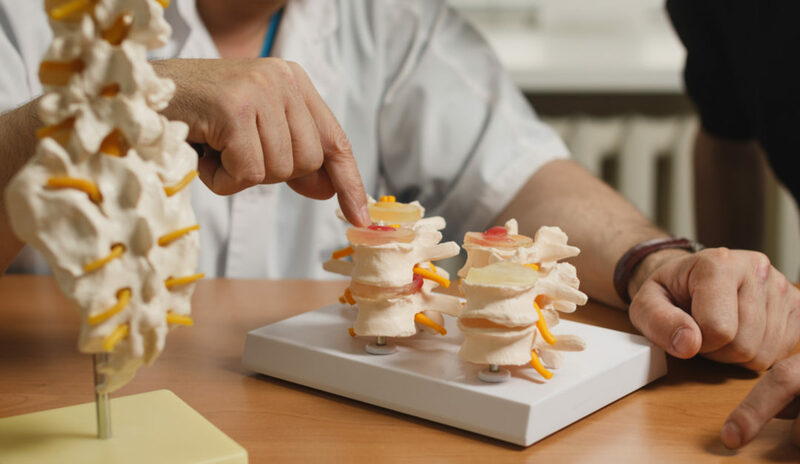 The spine specialists at New Jersey Spinal Medicine and Surgery treat conditions of the cervical and lumbar spine using both non-surgical and surgical modalities. New Jersey Spinal Medicine and Surgery is led by Dr. Dante Implicito and Dr. John Koerner. Both physicians have extensive training and experience in the utilization of Minimally Invasive Spine Surgery techniques as well as non-surgical techniques. Our doctors are regarded as New Jersey’s leading experts in Minimally Invasive Spine Surgery. Once your condition has been evaluated and diagnosed, a treatment plan will be made. If a nerve decompression is recommended, you’ll be given all the information you need to make a decision that’s right for you. Remember, the road to recovery starts when you walk through our doors. Am I a Candidate for Minimally Invasive Spine Surgery?